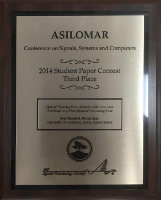 Best Student Paper Award, Third Place at the 48th IEEE Asilomar Conference on Signals, Systems and Computers (ACSSC), 2014. 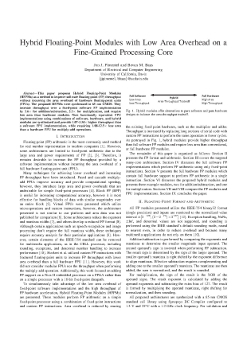 This paper proposes Hybrid Floating-Point Modules (HFPMs) as a method to improve software floating-point (FP) throughput without incurring the area overhead of hardware floating-point units (FPUs). The proposed HFPMs were synthesized in 65 nm CMOS. They increase throughput over a fixed-point software FP implementation by 3.6x for addition/subtraction, 2.3x for multiplication, and require less area than hardware modules. Nine functionally equivalent FPU implementations using combinations of software, hardware, and hybrid modules are synthesized and provide 1.07–3.34x higher throughput than a software FPU implementation, while requiring 1.08–12.5x less area than a hardware FPU for multiply-add operations. Jon J. Pimentel and Bevan M. Baas, "Hybrid Floating-Point Modules with Low Area Overhead on a Fine-Grained Processing Core," IEEE Asilomar Conference on Signals, Systems and Computers (ACSSC) Nov. 2014.